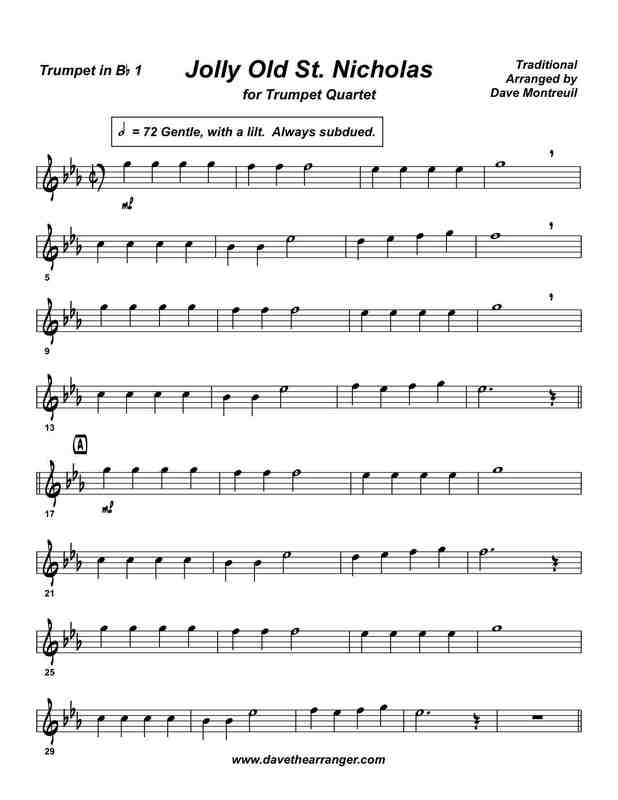 Here is a theme and variations version of Jolly Old St. Nicholas for 4 trumpets. Easy to play and easy to listen to. The mood is smooth, subdued and relaxed throughout, with a light swing section at the end. A perfect piece for beginning groups, but professionals will appreciate it's beauty and simplicity. The first trumpet part might be a bit tiring (see the sample sheet below), but that is too keep the fourth voice playable. even now, now there are still a few low 'G's (concert F) in the 4th part that can't be heard on the computer playback. Right click here to download the playback for Jolly Old St. Nicholas.